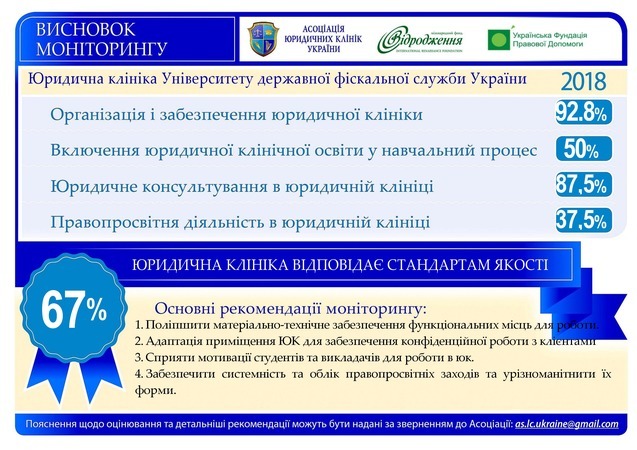 Results of the monitoring of the legal clinic of the National University of the State Fiscal Service of Ukraine. Monitorng was held during 31 of May – 1 of June and showed that said legal clinic is highly responding the Standards and was evaluated for 67 percent out of 100 possible. Monitorings are being held within the implementation of the ‘Development of institutional capacity of the Association / network of legal clinics of Ukraine’ Project in partnership with the Ukrainian Legal Aid Foundation, supported by the International Renaissance Foundation.